I have been wanting to fly to the border for long time. My quest started almost 10 years ago when I did my first attempt on breaking the Hollister Mad Dash straight out distance. After years of flying mostly straight outs in hang gliders, it felt natural to me, so during my first season on my first sailplane (LS4) I was focusing on breaking Tom Hubbard's 185 miles record to the Grapevine, and indeed on 5/11/2000 I finally made it to Tehachapi. Back then, Tehachapi and Mojave were considered the ultimate goal, and no one dared thinking much further. The following year I made it to Mojave, and the year after I made it to Barstow. 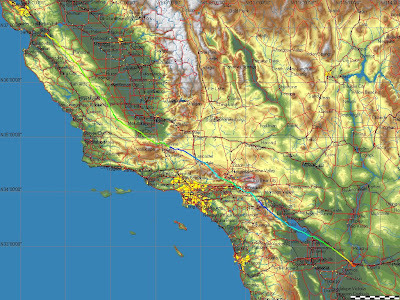 But the real break through came with Brian Choate's historic flight to Palm Springs area in 2003, some 362 miles from Hollister. What was so unusual about his flight, was that after sinking like a rock on the back side of the Gorman pass, a few minutes from having to crash land on a dirt road, he contacted wave at 800 ft AGL(! ), taking him all the way to 18K which gave him over 100 miles final glide to Bermuda Dunes. The idea that it might be possible to fly thermals to the Grapevine, then transition to wave flight, was born, but no one (including Brian) really wanted to repeat this, so we all continued focusing on thermal flights. Around this time we started to talk about flying to the Mexican border, first as a joke, but later as a real goal. Making it to the border became the ultimate dream flight for Eric Rupp and myself. I continued attempting to break the mad dash record at least once every year, and while continuing making it further and further all the way to Hemet, it became evident that breaking Brian's record is going to be very challenging, and will require an epic day, mostly due to the complex terrain further south which requires multiple shear line transitions, in which the sun usually won the race. While gaining more experience on how to actually accomplish the task, I also became more creative with my retrievals. Usually my wife would crew for me while we were going on trips down south, but occasionally I used other methods of self retrieve, such as landing at gliderports and flying most of the way back the next day, or taking a Southwest airline back home after landing not far from Ontario. Then, on 6/21/08, 5 years after Brian's flight, the ultimate breakthrough came with Eric's outstanding 444 miles flight to Calexico, making him the first man who made it to the border. Eric proved that with the right day, preparation, determination and skill, nothing is impossible. For a while it seemed like this fight will seal the Hollister Mad Dash, as there is no where to go further south without landing in Mexico, until Kempton suggested Yuma, AZ, as the ultimate goal, as it sits further east right where the 3 corners of California, Mexico and Arizona meet. There is practically nowhere to go further from there as it is all surrounded with border, restricted areas and many miles of unlandable terrain with no airports. A quick check confirmed that by overflying the airport by a few miles, the 10% requirement for new mad dash record can be met. What's more, Yuma is directly downwind from Hollister in NW wind, making it the best goal for NW wind wave. On April 14, it became evident that the next day is going to be the day. A large very cold low pressure was moving down with strong NNW flow. All the forecast models and blipmaps pointed to moderately strong NW wind with relatively high base cu's (up to 9K) all the way from Hollister to the grapevine. This is especially rare since often there are no clouds near the grapevine, and if there are, they are typically too low to safely cross the passes in strong wind. In addition, the wind was predicted to be much stronger, up to 50 knots, further south, virtually guaranteeing wave down wind of the pass. Yuma suddenly looked doable, and if all goes as forecasted, it may even be easy. But the hardest task was to overcome all the logistic obstacles. First we needed to generate enough excitement to justify a tow pilot on a day when HGC is closed and the runways were closed for maintenance till noon. Once this was accomplished (thanks Quest! ), the next problem was to get time off from work for the 2 days the trip will require, find a babysitter and convince my wife that driving for 12 hours, alone, with a trailer, can be fun. Apparently my level of confidence in the weather forecast was so high, that I managed to make it all happen. I then sat down with my computer until late at night, analyzing maps, flight traces and weather, and carefully planned the flight. I figured that even a noon launch, which is relatively late for record attempts, will still do thanks to the strong wind. But it was also clear that the key to make it is the transition to wave south of the Grapevine. It will not be possible to accomplish such a distance using only thermals in 7 hours so early in the season, as the Mojave Desert thermals are relatively poor this time of the year. Without wave I would have landed somewhere in the Mojave desert in 30-40knots wind, not so pleasant. On the morning of the flight, everything looked as expected. The forecast was still holding, and cu's were everywhere and already high enough when I arrived at Hollister airport around 10AM. I knew that today is the day. I even shared my plans and my goal with few friends, but avoided announcing it on hgcgroup so not to jinx it, as last time I announced my intention to go to the border, I landed at Panoche instead. Due to the downwind nature of the flight, and the expected wave flight, I decided not to bother with water ballast.I took a local tow around 12:15 and released around 2000 ft AGL west of the airport, put promptly dropped to 1500ft AGL before finding a good climb to 5500ft. In retrospect, I should have dropped another 100 feet or release a little earlier, as it turned out I missed diamond altitude by 100 feet! The first portion of the flight up to the grapevine was uneventful. Bases were around 6K near Hollister, rising to 9K further south, exactly as blipmap predicted, and it was relatively easy to follow the clouds, with a 15+knots tailwind. The lift under the clouds was strong but often choppy, and I decided not to spend time trying to core if I didn't find the core right away, and just kept going. I took the usual route over the mountain ranges to Taft, and then moved further south east towards the Grapevine, where the Kern Mountains are lower and narrower, allowing safe jump to Mojave. The ridge tops there are around 5000 ft. Knowing that the wind was predicted to be over 50 knots in this area, I decided I will not attempt this if I can not get high enough before the pass. I slowed down significantly to get as high as possible (9000 ft) before I committed to go over the back, and by the time I got over the ridge top, at 3:20PM, I was down to 8000 ft. The wind was still below 20 knots on the upwind side, so with 3000 ft clearance above ridge top, and 3000ft or more above glide to the nearest airports in Mojave, it felt completely safe to hop over. I did hit more then 20 knots down on the back side, but for very short time and only lost 1000 ft or so before I hit the wave at 7000ft near Quail Lake/Gorman area. . The wind was blowing twice as strong down there. Landing in the Mojave desert would have been "interesting", but the look of the wave clouds did not left much to worry, the wave was obviously working there. Cloud base was about the same as in front of the pass, around 9000 ft, and it only took me 3 to 4 turns to establish in the wave in front of it. In less then 20 minutes I was approaching 18,000ft, with climb rate often exceeding 10 knots. Once I got close to 18, I pointed the nose downwind with 50 knots tail wind and ground speed of 120-150knots, following numerous wave undulations, perfectly spaced from each other, towards Palm Springs. I got down to 10,000 ft over San Bernardino before I hit the Cajon pass/Big Bear wave, but this one was only good to 14K with relatively slow climb, but I needed all the altitude I could get to be able to fly over the top of the clouds to the next gap without risking sinking into the clouds. The ground below me and in front of me was often completely obscured by clouds. Although I didn't need it, it was reassuring to have a turn and bank indicator. I knew I needed to be near 18,000 feet over San Jacinto to be able to go on a 130+ statue miles of final glide to Yuma. And indeed downwind of San Gorgonio Mountain I finally found a good climb back to 18K, right in front of San Jacinto, then one last climb to 17,500 ft down wind of it, near Palm Springs, before I went on final glide. My flight computer was showing I had Yuma with at least 4000 ft to spare, but before I got too excited I realized it was assuming 50 knots tail wind all the way down to the ground, which I knew will not be the case, as the Yuma AWOS was reporting less then 20 knots. As such, I decided to fly conservatively and stopped a few times in weak wave lift, although it was not really needed. It was interesting to notice how far down wind of the mountains I could find wave patterns of sink and weak lift. I needed to navigate around the restricted areas and through the 4 mile corridor between them, flew by the Mexican border, and received clearance to land from Yuma tower. I arrived over Yuma at 2500 ft, then over flew the airport by additional 3 miles to meet the straight distance requirement, before turning back to land at Yuma International Airport shortly after 7PM. I was greeted by the friendly FBO who also provided me with the airport courtesy car so I could drive to the nearby motel and wait for my wife who was still 5 hours behind. The next day it took us 12 hours to drive back home. Total OLC distance = 810.6KM (504 SM), 6:49 hours, 118.82 km/h. Straight Out distance to goal = 489.4 SM (787.6km) - a new Bay Area/Hollister record and first flight to Arizona from Hollister. A special thanks to Quest who towed us on his day off, to Joy for coming to help us on the ground, to Matt who brought this special day to our attention, to Kempton for suggesting Yuma as goal and providing great insight into the Gorman wave, and last but absolutely not least, to Katia, my lovely wife and crew extraordinaire, for driving 1000km in 12 hours to retrieve me, and putting up with me the rest of the time.